The Fusion Wooden Stool Charcoal is a sight to behold, and its contemporary design is set to be the main attraction in your interior. 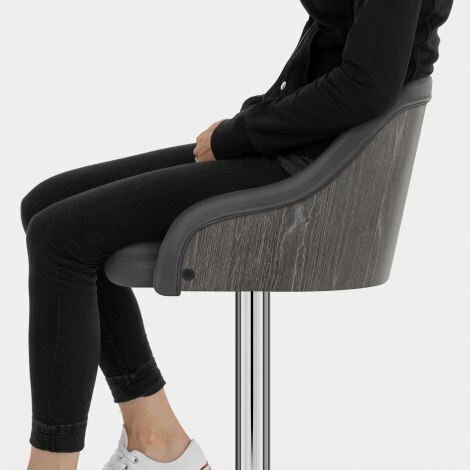 Thoroughly padded for your comfort, charcoal faux leather covers the seat and adds to the luxury, whilst the backrest sweeps round the seat to form two arms and has chic stitch detail. Highlighting the grain of the wood, the modern grey finish on the bentwood backrest offers exclusive appeal. A chrome frame sits below and features an adjustable height gas lift mechanism with 360-degree swivel to meet the needs of the user. 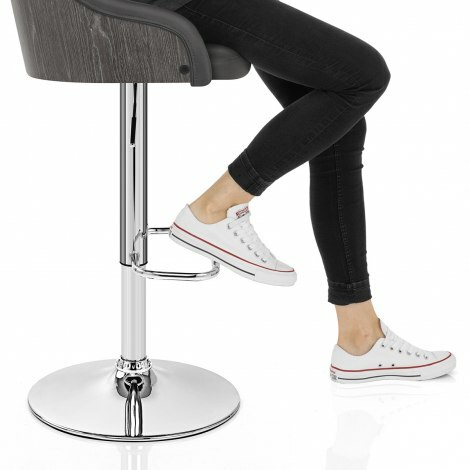 A rectangular footrest and protective guard complete the design, ensuring the Fusion will excel in your kitchen or bar area. "Great product and delivered on time next day"
Purchased to go with new breakfast bar installation, great product and delivered on time next day delivery. Looks like it will last quite some time.